Erlang is a concurrent, functional programming language designed for programming large industrial real time systems. The language is untyped and has a pattern matching syntax. Functions are written as a set of recursion equations and the language has explicit concurrency and asynchronous message passing. Written in a tutorial style, the emphasis is on learning through example and a number of well known problems in designing and programming concurrent fault-tolerant real-time systems are illstrated.New chapters on Distributed Programming, Distributed Programming Techniques and Distributed Data. This book employs a tutorial approach to guide the reader through the programming of real-time and distributed fault-tolerant systems. 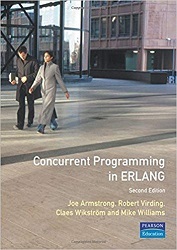 Written by experts in the field, this practically-oriented bok shows how the use of ERLANG results in modular systems which are easy to specify, design and test. Frederic Trottier-Hebert lives in Quebec, Canada.